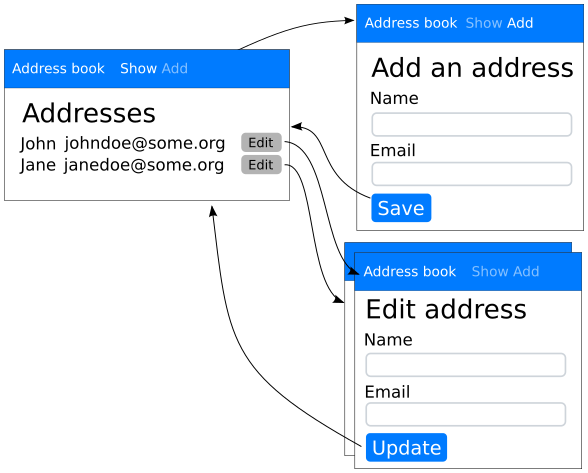 The AddressBook example can be changed to allow editing of existing Addresses. A View can have arguments—so that a single “Edit” View is defined for an as yet unknown Address. Computing the actual contents of the View is delayed until the Address argument becomes available. To specify that a View has arguments, create your own class that inherits from UrlBoundView. Give it an assemble() method with keyword arguments that represent the arguments to the UrlBoundView. If an EditView is requested for an address_id that does not exist, raise a CannotCreate to indicate that the EditView does not exist for the given arguments. To define a parameterised View, use the view_class keyword argument to define_view(). The framework parses arguments from the URL of the UrlBoundView and passes these into the call to assemble(). Fields describe how the framework manages arguments sent to the View via its URL. Each Field sent as a keyword argument to define_view() is used to compute the value of a matching keyword argument in assemble(). the application automatically switches to the UrlBoundView because of a transition. A Button has to be in a Form, so AddressBox must change to be a Form. Call with_arguments() on the Event to which the Button is tied so that the user will transition to an EditView matching that specific Address. form_name = 'address_%s' % address.id  # Forms need unique names! Not all the arguments passed to the .assemble() method of a View need to be parsed from the URL of the View. Sometimes it is useful to pass an object that is available in the .assemble() of the containing UserInterface to the .assemble() of one of its Views . For example, the .assemble() of a particular View may need access to a Bookmark which is computed inside the .assemble() of its UserInterface. A View can be parameterised by such arguments as well. Just pass the actual value as keyword argument to .define_view() . The framework distinguishes between normal programmatic arguments and those that have to be parsed from the URL based on the fact that Field instances are sent for the arguments that need to be parsed from the URL. At the end of the day they’re all just arguments to the View though. At the time of defining the Event or placing the Button the exact target View that will be transitioned to is not known yet. The target View transitioned to will depend on the Transition chosen – something only known when the Event occurs. So be sure to specify all possible arguments to all possible target Views of all possible Transitions from the View on which the Button is placed!